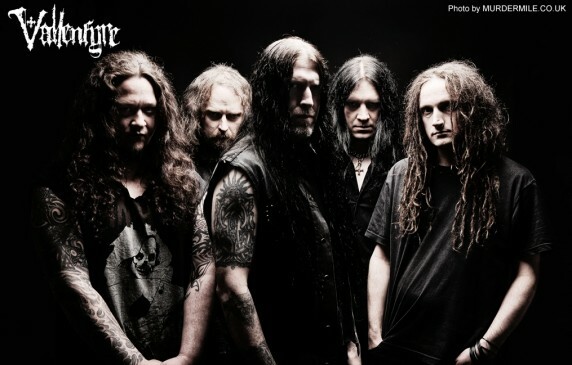 The Gauntlet caught up with Vallenfyre mainman Gregor Mackintosh (Paradise Lost) recently to talk about his new release 'A Fragile King.' The album came about when Gregor's father died at the end of 2009. "I went to grief counseling with my brothers and they told us to write stuff down. I started to do that and it naturally turned into lyrics. I started going back to my old demo and vinyl collection and decided that it was that music style that went with what I wrote. It became a musical therapy so I decided to turn it into something a bit more and got some friends involved and turned it into a band." The albums subject matter is a bit grim in that it deals with actual death. "I find it quite bizarre in metal music that it is fine to sing about imaginary death like ripping the entrails from a corpse. As soon as you start to talk about real death, people get a bit scared. It is weird. It is something that we would rather have out than hold up inside. Death happens to everyone so why not talk about it. I don't see any stigma about death now that I did at one time. It is part of life really." 'A Fragile King' was released this week via Century Media Records.